In recent years Liechtenstein has continued to improve the legal framework for wealth structuring and succession planning and to adjust to international developments. On 1 January 2011, the totally revised Liechtenstein Tax Act entered into force. With the new Act Liechtenstein introduced an attractive tax system, which complies with European law. With a corporate tax rate of 12.5 per cent and the reduction of the effective tax rate even further through the notional interest deduction, Liechtenstein has joined the league of most tax-efficient jurisdictions by European standards. Furthermore, the taxation of legal entities as private asset structures (PAS) offers an attractive way for individuals to structure their wealth. Liechtenstein is also an interesting jurisdiction for individuals to take residence. The top income tax rate for a resident of the capital, Vaduz, is 20 per cent. Income from assets that are subject to wealth tax is not taxed directly. Instead, tax is currently levied on a notional income of 4 per cent of the tax value of these assets. Moreover, a favourable lump-sum taxation regime is available for foreigners, and there is no inheritance or gift tax. 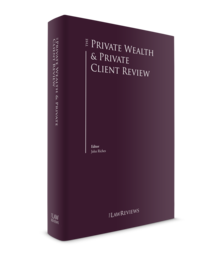 Liechtenstein has a long-standing tradition of private family foundations that continue to be attractive vehicles for wealth preservation and succession planning. With the latest reform of the Liechtenstein Foundation Law in 2009, a new foundation governance structure was implemented, providing for more checks and balances regarding the interests of the founder, the beneficiaries and the foundation itself, while the favourable opportunities for wealth planning have fully been preserved. The rules regarding the enforcement of forced heirship rights were amended, resulting in considerably more room for estate planning. Liechtenstein has a long history of its own trust law. In 1926, Liechtenstein incorporated the institution of the trust, based on the English Trust Act of 1925, into national law. Since then, the Liechtenstein trust has developed into a popular vehicle for wealth structuring and succession planning. Furthermore, with the implementation of the Alternative Investment Fund Managers Directive (2011/61/EU) (AIFMD) of the European Union into national law, Liechtenstein has incorporated a new investment fund referred to as a 'Smart Fund', which provides another internationally recognised, tax-neutral vehicle for structuring private wealth. Trusts managed from Liechtenstein are subject to an annual tax of 1,800 Swiss francs. No tax filings are necessary. The net income is reduced by income from foreign permanent establishments, rental and lease income from foreign real estate, gains from selling real estate, distributions from foundations or trusts, dividends and capital gains on the sale of shares and unrealised capital gains on shareholding in companies both in Liechtenstein and abroad.3 In general, dividend income and capital gains from the sale of shares are tax-exempt. As a result, not only income and capital gains from interests in partly or wholly owned subsidiaries, but also income and capital gains from shares held as part of a securities portfolio, are in principle tax-free. However, in 2016, a number of the Organisation for Economic Co-operation and Development (OECD)'s Base Erosion and Profit Shifting (BEPS) measures were implemented in the Liechtenstein Tax Act. As a result, dividend income is no longer tax exempt if: (1) the shareholding in the respective subsidiary amounts to at least 25 per cent of the capital or voting rights; and (2) the share of profits are treated as expenses deductible for tax purposes by the subsidiary.4 This means that if a Liechtenstein entity receives dividend income which for some reason is classified as tax deductible interest payment in the country where the dividend was declared, Liechtenstein will be forced to tax the dividend if the 25 per cent holding threshold is met. In addition, the Liechtenstein Tax Act will be further amended in 2018, implementing the European Anti Tax Avoidance Directive. It is expected that losses resulting from a sale or impairment of participations will no longer be tax-deductible as of 2019 in order to terminate the asymmetric treatment of (tax-free) profits and tax-deductible losses. more than 25 per cent and the effective taxation is less than 50 per cent in a comparable domestic case. This 'switchover' rule will also apply as of 2019, but legal entities existing on 1 January 2019 will only become subject to the new regime in 2022. The new tax law introduced a notional interest deduction, which is currently 4 per cent of the modified equity as a deemed expense to ensure equal treatment of debt and equity. The reason for the first three deductions is that they produce tax-exempt income and capital gains and, therefore, cannot be used to create a notional interest deduction. The term 'all assets' refers to the balance sheet total.6 In case of 100 per cent equity funding, the effective notional interest deduction is reduced from 4 per cent to 3.76 per cent because of the deduction of 6 per cent of the total of all assets (100 per cent – 6 per cent = 94; 94 x 4 per cent = 3.76 per cent). The table below shows the effects of the notional interest deduction, assuming 100 per cent equity financing for various return-on-equity (ROE) scenarios and the resulting earnings before interest and taxation (EBIT). It is evident that the notional interest deduction can result in a substantial reduction of the effective tax rate. Obviously, the effect is higher the closer the ROE is to the 3.76 per cent effective notional interest deduction. However, even in the case of a highly profitable company yielding a 20 per cent ROE, the notional interest deduction results in a decrease of the effective tax rate from 12.5 per cent to 10.15 per cent. In 2011, Liechtenstein introduced a notional expense, which may be deducted from any income from intellectual property (IP) rights. The notional expense amounts to 80 per cent of the respective net income. This IP box regime was approved by the European Free Trade Association (EFTA) Surveillance Agency (ESA) in its decision of 1 June 2011. However, in the course of the BEPS action plan, the OECD has defined new taxation standards for IP box regimes, referred to as the modified nexus approach. Like many other countries, Liechtenstein is now implementing the measures of the OECD BEPS action plan. Liechtenstein's government therefore abolished the IP box regime after the 2016 tax year. However, taxpayers who already take advantage of the Liechtenstein IP box regime will be allowed to benefit from it until 2020. As an alternative to regular company taxation and inspired by Luxembourg's private asset management company, the Liechtenstein legislature devised a new tax privilege for legal entities that are only engaged in the management of their own assets and do not perform any commercial activity. A PAS is only subject to the minimum corporate income tax of 1,800 Swiss francs annually without having to file any tax returns. Taxation as a PAS was approved by the ESA as being compliant with the European competition law on 15 February 2011. The main feature with regard to the tax privilege is the lack of commercial activity. Article 64, Paragraph 1(a) of the Tax Act exemplifies, by reference to the Asset Management Act, what is not considered a commercial activity. This includes the acquisition, possession, management and sale of transferable securities such as bonds, stocks, money market instruments, shares in investment undertakings and derivatives. Likewise, buying, holding and selling of precious metals, artwork and similar assets is generally possible. In its decision approving the provisions on the PAS, however, the ESA indicates that transactions in securities when effected 'as part of a commercial share dealing activity' constitute economic activity. Regular and active trading of securities (and other assets) is therefore not considered permissible for a PAS unless decisions are delegated to an independent asset manager. The purchase and sale of securities as part of a long-term investment strategy is, however, allowed in any event. As the mere exercise of ownership and the granting of benefits by the entity to its shareholders or beneficiaries are not considered commercial activities, the holding of a property does not constitute a commercial activity as long as the property is used by the PAS or its shareholders and beneficiaries and no rent is charged. When a PAS holds shares in a subsidiary that exercises a commercial activity, neither the PAS nor its shareholders or beneficiaries are allowed to exercise any control over the management of the subsidiary through direct or indirect influence, otherwise the PAS itself will be regarded as commercially active and lose its status as a PAS. When comparing regular taxation with PAS taxation, it turns out that in some cases there may be only a small difference in the tax burden because, even in cases of regular taxation, the income from the management of the legal entity's own assets tends to be tax-exempt anyway. The table shows that a Liechtenstein legal entity that is taxed as a PAS does not have any tax advantage over a regularly taxed company if it only holds shares, or real estate outside Liechtenstein. The reason is that even under regular taxation any income or capital gains produced by these asset classes will generally be tax-free anyway. In the case of the other asset classes, whether taxation as a private asset structure is preferable over regular taxation depends on whether the asset classes yield more than the 4 per cent notional interest deduction applying in case of regular taxation. The Liechtenstein tax regime for the taxation of individuals combines income and wealth tax. The wealth tax is based on the notional income of currently 4 per cent on the taxpayer's assets, which is then subject to income tax in lieu of the real income from such assets (which is tax-free). There is an eight-stage scale for determining the income tax. Individuals having their residence or habitual abode in Liechtenstein are taxable on their entire wealth and income. While residence means the place where a person lives with the intent of staying permanently, habitual abode refers to the place or area in which a person dwells not only temporarily. The Liechtenstein Tax Act considers a temporary continuous abode of more than six months as habitual abode, whereby short-term interruptions are not taken into account. Limited tax liability applies to individuals whose residence and habitual abode is not in Liechtenstein. Such individuals are taxable in respect of their Liechtenstein wealth and income. Tax-exempt income includes income from wealth for which the taxpayer pays wealth tax, recurring benefits to the taxpayer, which are considered as taxable wealth, and income from permanent establishments abroad. The Tax Act provides for certain exemptions from wealth tax. In particular, real estate and permanent establishments abroad are exempted from wealth tax. Taxpayers are also entitled to make certain deductions, such as reducing assets by debts and other liabilities, provided that the taxpayer is liable as principal debtor. With regard to trusts, foundations and similar vehicles with Liechtenstein residents as settlors or beneficiaries, the following rules apply. The wealth of revocable foundations, trusts and establishments with a foundation-like structure is attributed to the founder and wealth tax is paid by the founder. However, it is possible to opt for taxation at the level of the trust, foundation or similar structure instead. In the case of irrevocable trusts, foundations and establishments with a foundation-like structure, a distinction is made between entities with determinable beneficiaries that benefit from a certain quota and entities where this is not the case. If such structures have no determinable beneficiaries entitled to a certain quota, no wealth tax is payable because the wealth cannot be attributed to any natural persons; however, if such structures are established by Liechtenstein tax residents, the set-up itself triggers a special tax as follows. Such transfers to a discretionary structure are subject to taxation to the extent that: this wealth is no longer subject to wealth tax; and benefits or shares do not become liable to wealth tax.11 For example, the first prerequisite is not met if real estate abroad is transferred as this is exempted from wealth tax. The transferor shall pay a tax in the amount of 3.5 per cent of the wealth tax value of the contribution plus the applicable municipal surcharge. If a tax resident of Vaduz (where the municipal surcharge is 150 per cent) establishes a foundation or trust where no quota can be attributed to the beneficiaries and, therefore, the assets are no longer subject to wealth tax, the set-up is therefore taxed at a rate of 8.75 per cent. The assets will then no longer be subject to wealth tax. However, any distributions from such a foundation or trust to a beneficiary who is a Liechtenstein tax resident will be subject to income tax. The taxation of individuals is based on a combination of wealth and income tax: the wealth tax is integrated into the income tax by transforming a part of the wealth into an additional category of income. This transformation is based on a notional income.13 To determine the taxable base, wealth and income are calculated separately and then a notional income from the wealth is assumed. The interest rate for determining the notional income from wealth is determined annually in the Finance Act, being 4 per cent for 2018. This notional income from taxable wealth is then considered income (instead of the real income) and added to the total taxable income. After basic exemptions up to 15,000 Swiss francs (and up to 22,500 Swiss francs in the case of single parents within the meaning of the Family Allowance Act and up to 30,000 Swiss francs for jointly assessed married couples), taxable income (including the notional income resulting from wealth tax) is then taxed at different rates for eight income brackets, with the highest rate for the national income tax being 8 per cent. Additionally, the Liechtenstein communities may levy a municipal surcharge of between 150 per cent and 250 per cent on the national tax. Currently, all Liechtenstein communities levy a surcharge of between 150 per cent and 200 per cent on the national income tax, with the rate in Vaduz being 150 per cent. The top tax rate for a resident of Vaduz therefore amounts to 20 per cent and applies in the case of a non-married taxpayer without children if his or her annual income exceeds 200,000 Swiss francs. Inheritance tax and gift tax have been abolished in the course of the revision of the Liechtenstein Tax Act. Under the new Liechtenstein tax regime, just a disclosure of donations to the fiscal authority is required. Liechtenstein-resident donors and recipients of gifts must therefore include gifts in their tax returns. The purpose of this notification is to enable comprehensibility of declarations of wealth set out in the tax returns of these individuals (i.e., the information is only declaratory).14 The disclosure requirement applies only to gifts, inheritances and bequests exceeding 10,000 Swiss francs. Individuals can apply to the fiscal authority for lump-sum taxation (i.e., apply for taxation on expenditure instead of income and wealth tax). The latter does not apply to real estate in Liechtenstein, which remains subject to wealth tax. Liechtenstein citizens are not entitled to apply for such lump-sum taxation. Another prerequisite for the application is that the individual takes residence or habitual abode in Liechtenstein for the first time or after an absence of 10 years or more from Liechtenstein. The individual must not be entitled to work in Liechtenstein but shall live on income from his or her wealth or other receipts from abroad. The discretionary decision regarding the lump-sum taxation is up to the Liechtenstein fiscal authority. The lump-sum taxation considers the total expenditure of the taxpayer, and the tax based on the expenditure amounts to 25 per cent of the expenditure.15 The tax may be determined for several years depending on the regularity of the amount of the expenditure. Individuals intending to apply for lump-sum taxation must also take into account the applicable provisions in conjunction with the permission to reside in Liechtenstein. Currently, residence permits are quite restricted, although there is a lottery open to citizens of the European Economic Area. Furthermore, several times in the political process there have been discussions to issue more resident permits to wealthy or highly qualified foreigners but no final conclusion has been reached. Generally, under the Liechtenstein Private International Law Act, all aspects of legal succession are governed by the law of citizenship of the deceased, which will be applied by the Liechtenstein courts. Foreign testators and Liechtenstein nationals living abroad may, however, choose the law of the country of their last residence instead, which offers some planning opportunities. The enforcement of forced heirship rules against Liechtenstein trusts, foundations and other fiduciary structures has been the subject of several court cases and has consequently led to actions by the Liechtenstein legislator. If the founder is not a citizen of Liechtenstein and not resident in Liechtenstein, his or her entire estate is governed by law of the country whose citizen he or she was at the time of his or her death (unless the founder chose the law of the country of his or her last residence instead in a will). That law will also apply to the questions of whether there is a forced share for certain family members and whether such compulsory heirs can challenge transfers to a trust or foundation under certain circumstances. As a result, if a foreign resident has established a Liechtenstein trust or foundation, any challenge of the transfer of assets will generally be based on the law governing his or her estate, not on Liechtenstein compulsory heirship law. Accordingly, the Liechtenstein Supreme Court has allowed claims of foreign heirs in several cases based on the applicable foreign heirship law, irrespective of the fact that the Liechtenstein two-year statute of limitations had expired. In practice, this means that if a foreigner establishes an irrevocable discretionary trust or a foundation in Liechtenstein (without reserving any revocation rights or equivalent powers) and chooses Liechtenstein law as the law governing the transfer of his or her assets to the foundation or trust, any claims of any compulsory heirs under the applicable inheritance law will become time-barred after the expiry of two years from the transfer of the assets to the trust or foundation. Alternatively, a potential claim of compulsory portion will generally also be denied, if a founder makes an inter vivos donation to a Liechtenstein foundation and agrees that such contributions will be governed by a jurisdiction not having forced heirship rules at all.26 However, this concept has not yet been contested in court, and it seems possible that under certain circumstances a court could rule that a foundation cannot rely in good faith on such a choice of law for the transfer of assets to the foundation, if it was designed only to frustrate the rights of compulsory heirs under the applicable inheritance law. the use of a Liechtenstein foundation as a private trust company instead of a trustee company owned by a financial service provider. In the course of the implementation of the AIFMD in Liechtenstein, a special investment vehicle was created for families. If the investor circle only consists of members of a single family then a 'Smart Fund' can be set up. A Liechtenstein Smart Fund is an alternative investment fund in the meaning of the Liechtenstein AIFM Act and the AIFM Ordinance.27 It provides an opportunity for families to create a tax-neutral, internationally recognised investment vehicle for family members only (i.e., all family members who are or have been related by marriage or registered partnership, by direct or collateral line or by inheritance). For foundation governance purposes, it is necessary to distinguish between common-benefit and private-benefit foundations. For instance, a common-benefit foundation requires a registration in the Commercial Register to acquire legal capacity. By contrast, private-benefit foundations acquire legal capacity by the declaration of establishment. While a common-benefit foundation serves entirely or predominantly common-benefit purposes, a private-benefit foundation serves entirely or predominantly private or personal purposes. If this is unclear, the foundation is treated as a common-benefit foundation. Common-benefit foundations are subject to supervision by the foundation supervisory authority (i.e., the Office of Justice).30 This authority must ex officio ensure that the foundation assets are managed in accordance with the purpose of the foundation. The law grants certain information rights to the authority; for example, inspection of the foundation's books and right to information in relation to the foundation. Furthermore, the authority may apply to court to control or remove foundation bodies, to carry out special audits or to cancel resolutions of the foundation council. Such measures are available for all foundation participants,31 including the founder, the beneficiaries, the foundation bodies and the members of these bodies. As a rule, private-benefit foundations are not subject to supervision by the foundation supervisory authority. This can be changed if the articles of the foundation (voluntarily) provide for supervision. In summary, it can be stated that the Liechtenstein legislator has implemented various checks and balances. Because of a lack of mandatory supervision of private-benefit foundations by the foundation supervisory authority, information rights particularly granted to the beneficiaries are necessary to guarantee a control mechanism. On the other hand, the interests of the founder are also safeguarded by allowing several ways to exclude or limit the information rights of beneficiaries in certain cases. Asset protection and protection of creditors obviously reflect opposing interests. Needless to say, the settlor of a Liechtenstein trust or foundation seeks to protect the trust or foundation assets against third parties, but the interests of the founder or settlor are generally in conflict with the demands of third parties. Creditors may consider different options to enforce their claims towards the founder of a foundation or trust. First, creditors may dispute contributions of assets to the foundation in the same way as they would a gift.38 As a rule, every creditor having an enforceable claim is entitled to do so if full compensation could not be achieved by enforcement of the claim against the founder or settlor, or this could be assumed at the time of approval of the enforcement. Under Article 75 of the Legal Remedy Code, the challenge of a transfer of assets to a foundation or trust by a creditor must be possible under both the laws of the country of residence of the debtor and the law governing the transfer. As a result, if the transfer of assets to a Liechtenstein foundation or trust is made subject to Liechtenstein law, the challenge must be permissible not only under the laws of the country of residence of a foreign settlor or founder, but also under Liechtenstein law. Many families use trusts as an estate planning vehicle and for wealth preservation. Increasingly, instead of using a trustee company owned by a financial service provider, a private trust company (PTC) is appointed as a trustee. The use of a Liechtenstein foundation as such a PTC offers several key advantages. While using a PTC has several benefits, it begs the question of who should act as the shareholder of the privately held trustee company. In most cases, the shareholder cannot be the settlor of the trust because then the shares of the PTC would be part of his or her estate, which would frustrate the estate planning purpose of the trusts. A common set-up to solve this problem has been to establish a separate purpose trust whose only purpose it is to hold the shares of the PTC. The main drawback of this approach is that again a trustee is needed for the purpose trust holding the shares of the PTC. In most cases, a trustee company owned by a financial service company is used for this purpose. This means that the reasons for not using such a company as a trustee of the family trust are still present. However, they are moved to a remoter level and are mitigated because the only assets held by the trustee company of the purpose trust are the shares in the PTC. Using a Liechtenstein foundation removes entirely the need for a trustee company owned by a financial service provider and at the same time reduces complexity. The structure then simply consists of a Liechtenstein foundation acting as trustee of one or more family trust. A Liechtenstein foundation essentially is a fund endowed for a specific purpose that becomes autonomous and acquires the status of a legal person. It has no shareholders and therefore the question of who holds the foundation does not arise. Such a foundation can be established with the sole purpose to act as the trustee of one or more trusts for the benefit of a certain family. When a Liechtenstein foundation acts as a PTC, generally no special business licence is necessary in Liechtenstein. This was clarified recently by a submission of the Liechtenstein government to the parliament dealing with an amendment of the Trustee Act. The Liechtenstein Trustee Act deals with the regulatory framework for professional trustees and trust companies. In this submission,46 the Liechtenstein government clarified that a PTC does not qualify as a professional trust company and does not require a licence under the Trustee Act. The government noted that a Liechtenstein PTC, like all other Liechtenstein companies without a special business licence, requires a member of the board who is licensed as a professional trustee or in an employment relationship with such a professional trustee. According to the Liechtenstein government, no separate regulation of the entity acting as a PTC is necessary. The government pointed out that the licensing requirement only applies to 'professional' trustees and that a privately held trustee company typically does not meet this criterion because it is not used with the goal of creating profits. The government also mentioned that the fact of directors charging a fee to the PTC is not harmful either. Furthermore, the government stated that even if the Liechtenstein entity charges a trustee fee to the trusts, it still does not need to be regulated because the PTC offers its services only to a closed circle of persons. The government also specifically confirmed that a Liechtenstein foundation can act as a PTC. With the adoption of a tax law that is in compliance with European rules, and the revised foundation law, Liechtenstein has strengthened its position as an attractive jurisdiction for wealth structuring and estate planning. In spite of a demanding environment, Liechtenstein maintained its high degree of stability and the financial system has proven to be very reliable during the last financial crisis. Reputation, healthy government finances and market access are the key factors for ongoing success. In this context, it is noteworthy that Liechtenstein remains one of the few European countries with a long-term credit rating of AAA by Standard & Poor's Rating Services (Outlook: stable). 2 Article 61 of the Tax Act. 3 Article 48 of the Tax Act. 4 Article 15, Paragraph 2, Item n of the Tax Act. 6 BuA No. 48/2014, 33. 7 Article 54 Paragraph 3 of the Tax Act. 8 Article 14(2) of the Tax Act. 9 Article 6(4) of the Tax Act. 10 Draft Bill (BuA) No. 48/2010, 75. 11 See Article 13(1) of the Tax Act. 12 BuA No. 48/2010, 83. 13 BuA No. 48/2010, 25. 14 BuA No. 48/2010, 187. 15 See Article 33 of the Tax Act. 16 Article 552, Section 38(1) of the Persons and Companies Act (PGR). This provision shall refer to Sections 785 and 951 of the Civil Code (ABGB) entitling the heirs to challenge. See BuA No. 13/2008, 122. 17 See Section 785(1) of the ABGB. 18 See BuA No. 13/2008, 122. 19 Pursuant to Section 785(3) of the ABGB, donations that the testator made out of current income for charitable purposes in accordance with moral duty or consideration of decorum without diminishing the substance of property will also be disregarded. 20 See Jakob, Die Liechtensteinische Stiftung, 2009, margin No. 685 with references to Germany and Switzerland. 21 See Jakob, Die Liechtensteinische Stiftung, 2009, margin No. 686. 22 See Jakob, Die Liechtensteinische Stiftung, 2009, margin No. 687. 23 Supreme Court, 7 December 2012, 03 CG.2011.93. 24 See BuA No. 13/2008, 140. 25 See BuA No. 13/2008, 140 et seq. 26 See Jakob, Die Liechtensteinische Stiftung, 2009, margin No. 692. 27 See Article 155 of the AIFM Ordinance. 28 See Article 552, Section 1 of the PGR. Die Liechtensteinische Stiftung, 2009, 195 et seq. 30 See Article 552, Section 29 of the PGR. 31 See Article 552, Section 3 of the PGR. 32 Upon application, the foundation supervisory authority exempts a common-benefit foundation from the obligation to have an auditor in the case of low asset value. 33 See Article 552, Section 9(2) of the PGR. 34 See BuA No. 13/2008, 65; Jakob, Die Liechtensteinische Stiftung, 2009, margin No. 490; Article 552, Section 9(2) of the PGR. 35 Article 552, Section 10(1) of the PGR. 36 The founder can also be a controlling body pursuant to Article 552, Section 11(2), No. 3 of the PGR. 37 See BuA No. 13/2008, 68. 38 Article 552, Section 38(1) of the PGR. Reference is particularly made to Article 65 of the Liechtenstein Legal Remedy Code (RSO); see BuA No. 13/2008, 121. 39 The burden of proof will be carried by the creditor (see Article 65(2) of the RSO). 40 See Article 74(1) of the RSO. 41 See Article 2 of the PGR; in a case of misuse of a foundation by the founder. Also see Constitutional Court, 16 September 2002, LES 2005, 128 et seq. ; Marxer & Partner, Liechtensteinisches Wirtschaftsrecht, 2009, 107; Jakob, Die Liechtensteinische Stiftung, 2009, margin No. 708. 42 See Jakob, Die Liechtensteinische Stiftung, 2009, margin No. 710, providing conclusive arguments against such potential enforceability. 43 See Article 552, Section 16(2), No. 6 of the PGR. 44 See Jakob, Die Liechtensteinische Stiftung, 2009, margin No. 713. 45 Supreme Court, 5 February 2009, 2R EX.2008.5850-17. 46 See BuA 42/2013, 40 et seq.